Yesterday I flew into Milwaukee, WI on business. The marketing folks at Briggs & Stratton invited me to their factory to see new products and to discuss ways to help each of our businesses to grow and thrive. I was lucky to get flights that allowed me to land in the early afternoon so that I’d have about three hours to do some outdoor radio in the upper Midwest. But a 90-minute mechanical delay caused by a pesky pressure starting switch in the right engine of the my Southwest Boeing 737-700 engine cut into my plan to visit a local park. Fortunately there were some trees at the front of the Radisson Milwaukee West hotel where I was to call home for the next 38 hours. 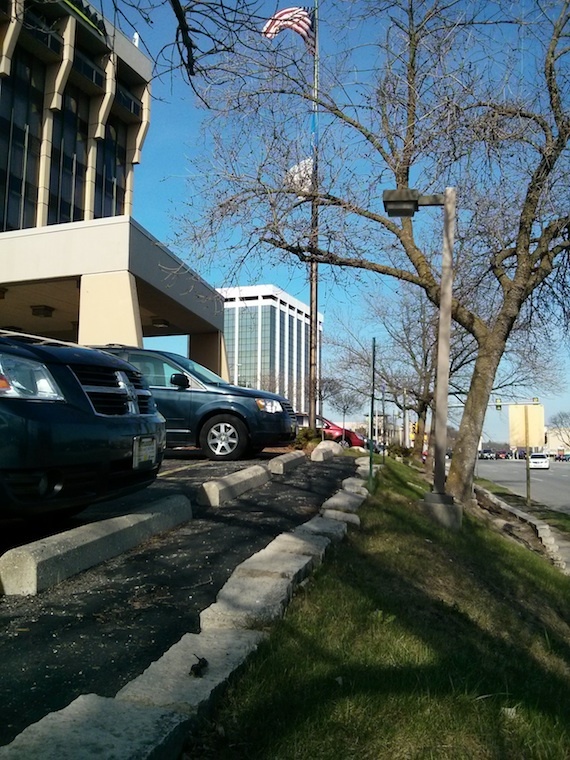 Here’s the front of the hotel and the tree just ahead supported my miserable sloper antenna. I was worried that the traffic and all the nearby buildings would cause too much noise and RF interference to be able to score a QSO. I was wrong. My first attempt at throwing my water bottle into the tree to get my micro-cord halyard up almost ended up in a disaster. I was in such a rush because I was running out of time, that I threw the bottle up not thinking about WHERE it would land. As it climbed into the sky over the tree, I suddenly realized, “Oh my gosh, it’s going to land in some car’s WINDSHIELD!” Quickly I grabbed the streaming micro-cord line to stop the bottle’s descent into the heavy traffic just 12 feet to my right. What a rookie mistake! I adjusted my throwing position so the bottle would now end up on the porte cochere roof of the hotel instead of the rush-hour traffic on the busy street next to me. 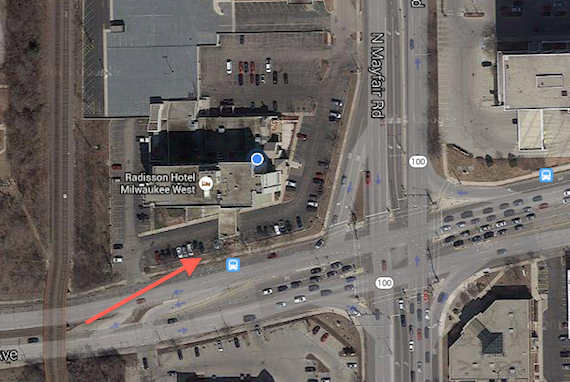 The red arrow points to where I was set up. It was a very steep small section of grass between the hotel parking lot and the busy street. My next throw wasn’t bad, but it could have been better. I decided that it would have to do as in just 40 minutes my ride would be here to take me to dinner. My multi-band Par EndFedZ antenna was a drooping sloper who’s last five feet hung over a branch that came down directly on top of where I was set up. I was sure it wouldn’t work. As soon as I turned on my HB-1B 5-watt radio, there were signals everywhere on 20 meters. Several were so strong I thought they were around the corner. You can see how close I was to the road. Cars and trucks were zooming past. I found a couple of operators who I wanted to reach out to, but they were in extended QSOs. I was running out of time. I called CQ CQ on 14.060, but no one heard me. 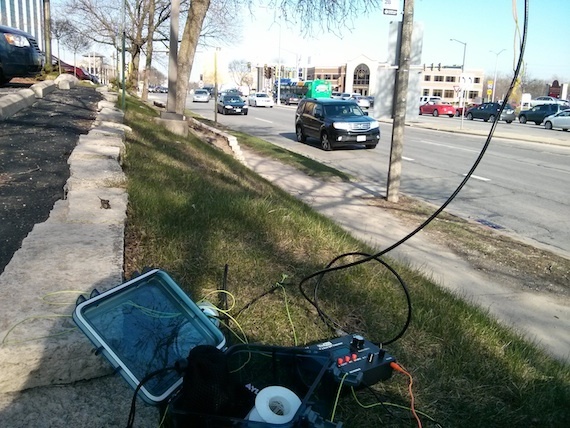 I texted my QRP outdoor radio mentor, Jim Cluett – W1PID, but he didn’t get back. I was desperate. No way was I coming 1,100 miles to get skunked. With just 16 minutes left, I went down to 14.035 and called CQ. I called a third time. BOOM! There was Rob, KW4HR coming back to me. He was so strong I thought my ear buds would break. 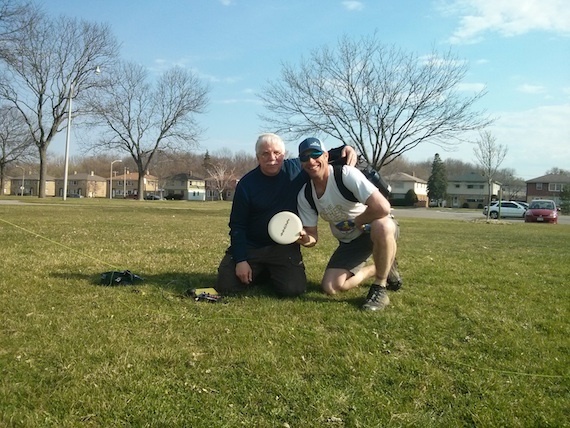 I told him I was QRP in Milwaukee and his signal report to me told me everything I thought about my antenna. Somehow he magically pulled me out of the ether with a 229. Thanks Rob for coming back and it was a pleasure to work you avoiding the skunk! I quickly packed up, went back to my room and got down to the front door just 90 seconds before my ride showed up. It was very fulfilling to do radio on that tiny sliver of grass in such a busy place! The wonders of QRP and what more and more to me is becoming true magic. 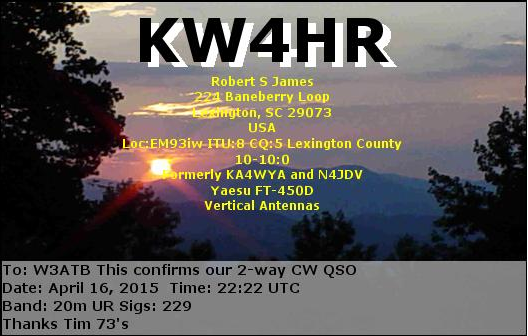 Here’s the electronic QSL card Rob sent me after the QSO. My day at Briggs & Stratton was action packed. I tested all sorts of their new equipment and the innovation is astounding. The day started out sunny and the warm spring sun shot the temperature up to 75 F before lunch. By 3:00 p.m. I was headed back to the hotel to get my radio. I had a good two hours to operate from a local park, and I was anxious to get there. 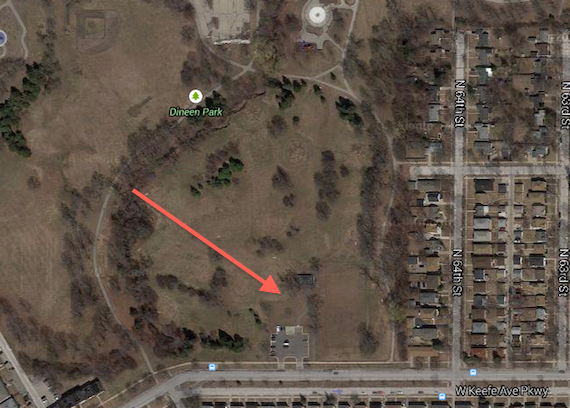 Using Google Maps I located Dineen Park about four miles away. Here’s Dineen Park. I was operating under a large tree next to the locked restroom building. Once there I noticed that the few people there had strange large rear-oriented fanny packs. Lo and behold, this was a frisbee golf park. Within a few minutes I had my antenna up and I was ready to get on the air. A few young men approached me very inquisitive as to why I was throwing a water bottle up into a tree. I showed them the little HB-1B and their eyes got as big as silver dollars. One of them was a nice guy named Fred Pagel. He’s a brick tender. Back in Cincinnati, we called them hod carriers. Fred works on construction sites and makes sure that masons have all the brick, mortar, block, wall ties, etc. they need to keep working. Here’s Fred and I. He wasn’t bashful and jumped right into the photo. You can see my green microcord that’s holding up my par EndFedZ antenna. The 20-meter band was as desolate as MayFair Avenue in Milwaukee at 4:00 a.m. in the morning. But I was determined NOT to get skunked. I texted by good friend Jim again, and he tried to listen for me, but there was no pathway between us. He was booming out at 80 watts to me and I heard nothing. It was time to call CQ. I tried on 14.060, but it was like being alone in the forest. No one came back. I drifted lower on the band trying CQ again. Nothing. Then I spun the VFO knob on the trusty HB-1B and shazam! I heard a booming signal calling CQ and he was blazing fast. I estimate he was at 25 WPM, but the code was clear to me. Immediately I sent back my call sign and he came right back with a fast 599 RST. I gave him the same and rejoiced. No skunk! But being the rookie I am, I didn’t realize who I had worked. The 1X1 call sign had not sunk in. It was a special event station that was honoring all Native American Code Talkers that have served in all USA conflicts. I texted Jim and moment later he called me. Here’s what Jim’s taught me about outdoor QRP radio. It’s as hard as it gets. You’re using low power. Your antenna setup is rarely ideal. The WX can be your foe and it’s simply a hard hard way to score a QSO. But by gosh I was determined NOT to leave that park until I got a QSO. Well, all I can say is that it’s immensely rewarding. I was beaming as I packed up my gear to head back to the hotel. I now wonder what the next level of outdoor radio will be. No doubt something even more rewarding.